A group show of paintings by Michelle Irving, Alison Akal, Haley Wright, and Ilma Matthews titled Light and Space is currently running at artSPACE durban. Michelle Irving studied Fine Art at the University of KZN in Pietermaritzburg and illustrated for magazines during her studies. She then worked at Creative Stationary as a designer, and produced a top seller in Australia. She started her own business doing murals and commissioned oil paintings. She finally left commission work and began to paint what she wanted to, exploring what moved her soul. Since 2011, Irving began painting with Gail Baxter and has exhibited with the North Coast Art group at the La Lucia Mall. She has also exhibited at the Botanical Gardens and at Spice restaurant. She selects commissions that appeal to her, in order to allow her emotions to penetrate the painting. Alison Akal studied at art school and qualified as a textile designer, working in design studios before becoming a freelance artist. She has been selling artworks in Durban galleries since 2010. She does private commissions, working off what the client requests and has been painting in Gail Baxter's art studio since 2008. Haley Wright has always had a love for painting and has been painting since her school days. 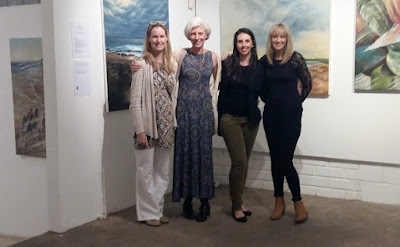 She attended lessons with Grace Kotze, Pascale Chandler and Gail Baxter as well as having attended various workshops by Lian Zhen (water colourist) and Grace Kotze. She has participated in Members exhibitions at the KZNSA Gallery and sold paintings on an online platform. Ilma Matthews studied art to matric, did a course with Fiona Kirkwood and still paints at Gail Baxter’s studio. Her first art exhibitions were with SmartArt in 2008 and 2009. She then started doing commissions and painted artwork to raise funds for different charities. She has exhibited in The Gallery in Westville and Spice restaurant. For the last two years she has exhibited at the annual Hilton Arts Festival and taken part in the artSPACE durban Annual Affordable Art Show.